It was clean and the staff were fine. But overall it is expensive for what you get. It was clean and obviously in the process of being updated, so you know the housekeeping staff works hard. Give them a raise! the location is ideal. the chilis is nice that it is connected. Breakfast was great, the staff in the cafe was exceptional and friendly. Breakfast buffet always fresh. Front desk folks great. Housekeeping stingy on k-cups and extra coffee cups in room. The front-desk staff was amazing. They were very friendly, respectful, and helpful, and didn't make a big deal out of my legal name being different from the one I used (I haven't legally changed it yet). The beds were also ridiculously comfy. The location was also very convenient, and my traveling friends enjoyed the Chili's that shared the building. I'd be glad to stay here again, and I would recommend it to anyone who needs a good place in the area. Comfortable bed. Clean, although bathroom was in transition of construction. Staff was nice. The Chili’s next door has good food and great staff and most Chilis’ you go to these days leave a lot to be desired. Very convenient to where we needed to go. Friendly staff that gave good information and directions! 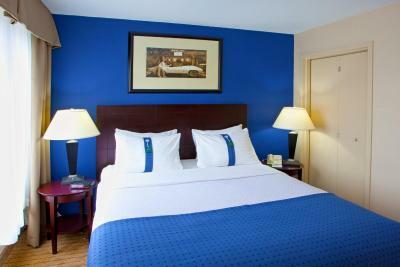 Holiday Inn Timonium This rating is a reflection of how the property compares to the industry standard when it comes to price, facilities and services available. It's based on a self-evaluation by the property. Use this rating to help choose your stay! 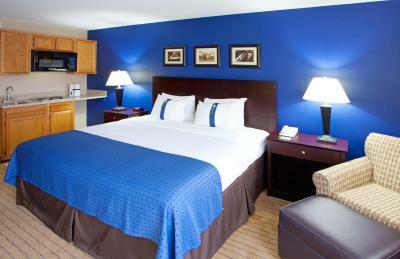 This hotel is 1 mi from Padonia Park Shopping Center and 2 mi from downtown Timonium, Maryland. It features a restaurant and rooms with a 32-inch flat-screen TV. Free WiFi is offered. 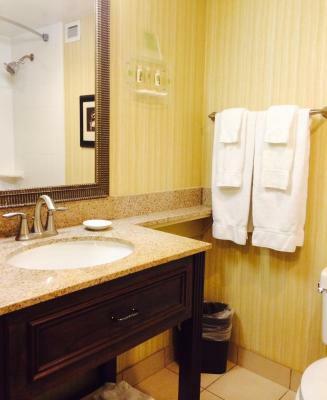 A microwave, refrigerator and coffee maker are standard in every room at the Holiday Inn Timonium. Free access to the seasonal outdoor pool and fitness center is provided to all guests of the Timonium Holiday Inn. A business center and free parking are also available. Chili’s Restaurant is open for lunch and dinner, serving Mexican and American cuisine as well as cocktails. The Holiday Inn also offers a buffet breakfast. Free shuttle services are offered to attractions within 3 mi of the hotel, including both Five Farms and Fox Hollow Golf Courses. The Baltimore Zoo is 11 mi from the hotel. 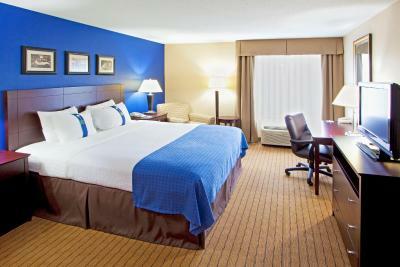 When would you like to stay at Holiday Inn Timonium? This room features a kitchenette, a flat-screen cable TV and a work desk. This room features a sitting area, refrigerator and microwave. This suite features a separate living room, a flat-screen cable TV and a work desk. This suite features a separate living room, a flat-screen TV and a kitchenette. House Rules Holiday Inn Timonium takes special requests – add in the next step! Holiday Inn Timonium accepts these cards and reserves the right to temporarily hold an amount prior to arrival. One elevator only worked. No carpeting in my room. The furniture inside the room looked very cheap. One elevator (of two) in the lobby was out of order. Not a huge issue but it was easier walking up 8 flights of stairs rather than waiting for the one elevator. Other than that, everything was great. the building's one elevator was out of service cause us to use the stairs because the one remaining elevator was too busy. The staff is NOT overly friendly at all. One person was borderline rude. construction related noises started at 8:00am. The facility itself was under construction. I was told about it when we arrived and we had a booking we could not cancel. 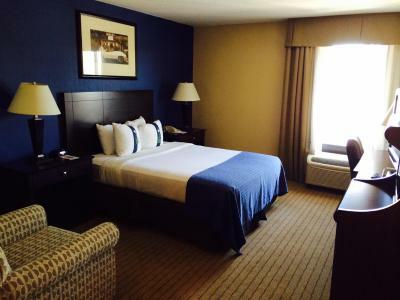 I love this location and the hotel is clean, the staff is friendly. The only negative thing I have to say is it took a while for the elevator to get up to the 6th floor when we were leaving. We could hear the construction workers talking, It sounded like they were talking to someone while the door was open, holding the elevator on that floor. It was only 5 minutes, no big deal, but we had an appointment to get to and it was a little frustrating. The 2nd elevator must not have been in service at the time. I was not informed renovations occurring during stay. Price should been adjusted. This day and age a Comfort height toilet should be standard. Tub stopper caused slow drain. Wi-Fi not secure. Thermstat went to a.c. mode if lowered by more than one degree while outside temp 5 degrees. No RFID protection for key cards so had to replace 8-12 times! LASTLY BECAUSE I USED BOOKING.COM THEY WOULD NOT ASJUST RATE. WE WERE THERE FOR FUNERAL AND EMERGENCY TRANSPORT FOR SURVIVING SPOUSE of deceased 5 STATES AWAY. The bed wasn’t comfortable. Way too firm. The staff did everything they could do to accommodate, spite of the construction going on due to remodeling. The shower was a little tricky to get to work, but I know they were doing work on the hotel while I was there, so that was likely part of it. One of my friends had trouble with noise, but that was because of the highway outside, and it wasn't the hotel's fault. I rented the room for a surgical procedure (topsurgery), and the beds were a little bit high, which made it hard to get in and out after the procedure, but it wasn't impossible. Overall the hotel was a very clean, comfortable, quiet, and accommodating. Thanks for a great experience! A little while before checkout time the water was shut off for maintenance work, making it impossible to get ready. I had to leave without taking a shower. Carpeting, walls, and appliances definitely need an major upgrade. It served it's purpose for the one night that I needed a room, but probably would not want to be there for longer. Cost and quality do not add up right now plus breakfast is not included. The bed was great, the shower was clean, but its a good thing they are working on renovations. People were great and they provided a shuttle service at no charge. It was under construction, but because of that, the price was great! Room lil small . Lady at front desk was rude and lady i called in afternoon for some info was rude aswell.